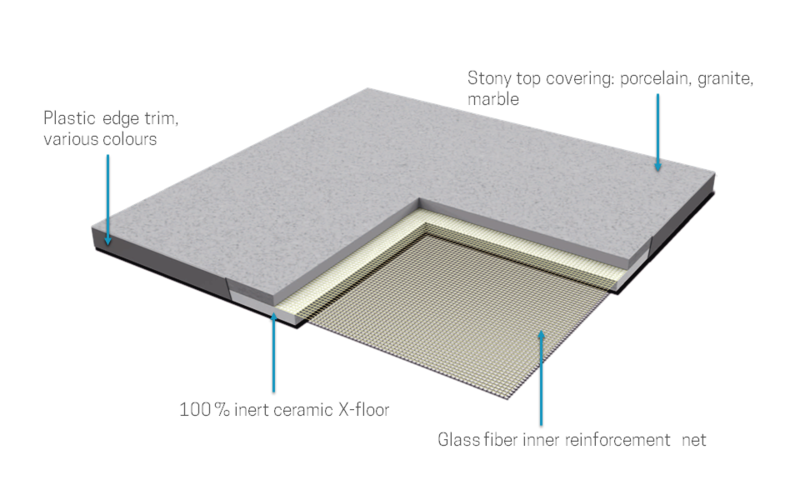 X-floor is an innovative, fully ceramic panel, developed to exceed the application limits of traditional panels (with chipboard or calcium sulphate) which, although technically valid and current, cannot be used in highly humid environments (basements, existent buildings with ascending humidity problems, etc.) or in outdoor applications (terraces, gardens, pool areas, solarium, etc.). The product is fully non-absorbent, even after prolonged submersion in water; the sole 26 mm thickness also makes it ideal when a low finished floor of just a few centimetres is required.